Here's what I love about this Bible. First, it is, in fact, a storybook Bible. Rather than trying to be a literal translation of the Bible, it tells the major Bible stories as stories, often combining several chapters into one story. This makes the Bible stories come alive, captivating both children and adults alike. For adults, I think this also showcases different aspects of Scripture. I literally wept over the beauty found in some of the Bible stories I hear most often, particularly those of Jesus' birth. Secondly, its author, Sally Lloyd-Jones does a fantastic job of connecting every Bible story to Jesus. In my research on the Christology of high school teenagers (published in The Jesus Gap) one of the things I found was how important it is to make those connections clear, to help people realize the Bible really is the “cradle of Christ” and that every facet of it points to Jesus. I love the fact that this Bible tangibly shows young children how to connect the dots between the Old Testament and Jesus. Third, the illustrations in The Jesus Storybook Bible are captivating. I appreciate that not every person is portrayed as white. While some illustrations are realistic, others are more whimsical. Hope enjoyed them all, often pulling the Bible closer in order to take a better look at a particularly interesting picture. Outside the Gospels, The Jesus Storybook Bible contains very little of the New Testament. I suppose this is because it's story-driven and it's hard to make doctrine into stories. Even so, I'd hoped for more of the New Testament – at least in Acts (only Pentecost and Saul's conversion are told). It does tackle Revelation, in a stunningly beautiful way that once again had me in tears. Additionally, I hate the fact that some of the illustrations are orientated vertically rather than horizontally. That may seem minor, but given this is a Bible that I assume is most often read aloud, constantly having to rotate the book is awkward. 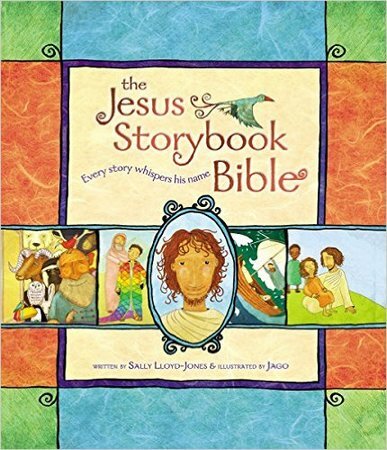 That said, Sally Lloyd-Jones has created a masterpiece in The Jesus Storybook Bible that I highly recommend for any family with young children. It will continue to be one of the Bibles we use to teach my daughter the story of our faith. What's more, I suspect I will come back to it at times even without her – to prep discussions for my youth ministry, sermons for my congregation, and at times, to simply recapture my own childlike faith.